G.I. Jones official zombie target! 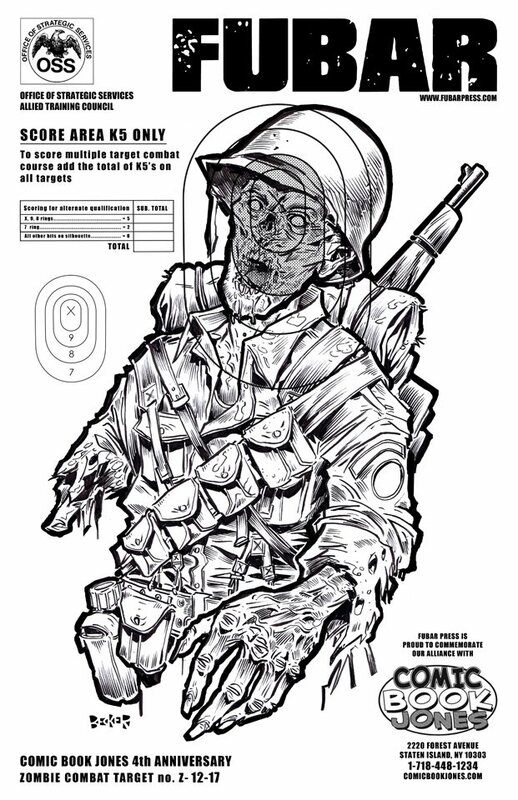 This is the newest FUBAR zombie target that I knocked out the other day exclusively for the Comic Book Jones 4th anniversary celebration blow-out which the FUBAR expeditionary force attended and participated in this past weekend signing and sketching books and pre-selling FUBAR: Empire of the Rising Dead. Comic Book Jones is a great shop and they really have everything and seriously know their products, know their customers and really recommend stuff that their customers are going to enjoy. I always find the best stuff in their shop and have a great time shopping there, you’d almost have to be a damn fool not to realize that this is how a comic retailer should appeal to fans of comics! Tiger and Socko and the rest of the CBJ staff really treat comic creators as friends, and even with all their success they remain truly indy friendly which is so big time cool for us trying to align ourselves with comics retailers who have interest in carrying FUBAR and spreading the word. The uniqueness of the shop really shows because while we were there we found out that they have been ranked by the powers that be that vote on the Eisner’s, that CBJ has been ranked amongst the top 10 comic retail shops in the world. So congratulations to them and this print will be available on the FUBAR etsy shop with the special CBJ partnership branding starting this coming week. Got a few new targets on the way, stay tuned true believers.